I would bet that anyone reading this article has at least one mole somewhere on his or her body. Most of us have many. For the most part, these flat or raised lesions are known as nevi. Some people love their facial moles and consider them beauty marks while others disdain these bumps and call them birthmarks. In reality, there are many hundreds of diagnoses that we call “moles”. Some are warts, some are hyperplastic sebaceous glands, some are fibrous tissue growth and on and on. The big problem is that some moles can represent malignant lesions such as melanoma. Melanomas are one of the most deadly cancers and for that reason, every man, woman and child should have a yearly full body mole check on their body to make sure there are no suspicious lesions. For melanoma cancers, the warning signs include asymmetry, border differences, color and diameter (size), so remembering A, B, C, and D is a good way to remember what may be dangerous. The chart below illustrates the more dangerous changes to watch out for. 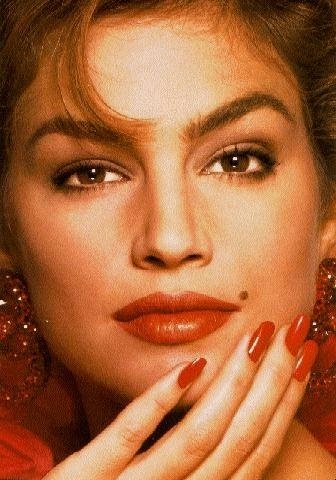 Assuming that the mole is benign, many patients want them removed for cosmetic purposes. Although there are many ways to remove the benign moles, I do not prefer the two most common means, which are freezing with liquid nitrogen or cutting with a scalpel and suturing. The problem with liquid nitrogen is number one, it hurts! Number two and more important is that it frequently leaves a depressed white scar as shown below. This is because it is difficult to control the lateral tissue damage and it is impossible to “stop” the tissue destruction from the freezing tissue. Removing moles with a scalpel and them suturing them is also a very common means or treatment, but this requires a surgical procedure which is more expensive and then leaves the patient with a scar in place of the mole. Sometimes the scar heals cosmetically, but many times it can be quite noticeable as shown below. 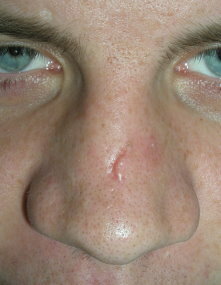 The above image shows an unsightly scar from surgical excision (cutting and suturing) of a benign mole on the nose. A new technology known as radiowave surgery can remove benign moles and related lesions of the head and neck with very cosmetic scars. The radiowave technology by creating radiowaves (yes, just like your AM and FM radio) and using them to melt away the mole. While I cannot guarantee any patient that they won’t have any scar, many times when the patient returns for an 8 week follow up, neither the patient or I remember where the mole was because the scar is so esthetic. In the thousands of moles I have removed on the head and neck, I have yet to have a patient feel that the scar was worse than the mole. The above picture shows tow moles immediately after being treated with the radiowave system. With radiofrequency, the actual mole removal takes about one minute for the average lesion. For lesions that are suspicious, I will perform a biopsy before treating them. The skin is first numbed with a topical anesthetic cream and then a small amount of local anesthesia. The radiowave device literally melts the mole away with very minor tissue damage and that is the key to a successful scar. The treated area will be raw for several days and is coated with Vaseline. In about 5 days the area will be smooth and pink and make up can be used to cover the pinkness. The pinkness will resolve in several weeks, but can persist longer in patients with very light complexions. Generally by the eight week follow up, there is little evidence of the previous mole. It is also important to use sun block over the treated area during the healing process. The above images show before and after images of radiowave mole removal cases. For flat brown lesions such as sun spots, age spots, liver spots, etc, the CO2 laser can also be a means of nonsurgical removal. The area in numbed and the laser removes the most superficial portion of the skin and the brown spot literally wipes off. The healing is similar to that of mole removal. The above image shows a large age spot wiped off with the CO2 lite laser.